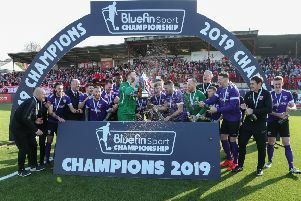 County Antrim retained the SuperCupNI Junior trophy thanks to a dramatic penalty shoot-out win at the Ballymena Showgrounds over Manchester United. Young goalkeeper Connor Friel went from villain to hero in the space of a few minutes. With Antrim leading 1-0, he made an error to allow Will Fish to equalise for United with just two minutes left on the clock. Friel turned things around moments later, making a vital save in the shoot-out from Owen Dodgson. Caolan McBride secured the SuperCupNI for his county, scoring the final penalty of the shoot-out. Long-serving Antrim boss Stefan Seaton said, “God love Connor. He took three steps forward when he didn’t have too and the United lad caught him out. “And so he did, because his penalty save was excellent. Seaton hopes his Antrim players using this SuperCupNI success as a springboard to greater things in football. “I’m delighted that we’ve won the tournament but there’s a bigger picture for us. I hope these boys now push on and get contracts in England or Scotland. “We have boys on trial with Celtic, Rangers, Liverpool, Leicester and others. Hopefully playing in this final will give them a taste of what it’s like to be a professional and what it’s like to play in front of crowds. Midfielder Charlie Allen thought he’d won the game with a fine goal four minutes from time. He took advantage of some hesitant defending from United, bursting into the area and place a low shot beyond the reach of Joe Lawton. It was a composed finish from Allen, who showed experience beyond his tender years. However, United’s Will Fish equalised two minutes later. He hoisted a long free-kick into the area, that goalkeeper Connor Friel was unable to deal. with. The over-hit free-kick slipped through the hands of the young goalkeeper. Incredibly, McCausland almost won the game in stoppage time. The Antrim burst through the United defence, only for his shot to be saved by the impressive Lawton. In the shoot-out, Charlie Allen scored for Antrim before Connor Friel saved Owen Dodgson’s strike. Sean Paul McAllister and Will Fish then exchanged goals, before Sean Stewart and Ola Ibrahim did likewise. Substitute Ronan Kalla was the next to score for Antrim, before David Mayamona kept United in the game. Caolan McBride then stepped up to the mark and scored for Antrim, winning both the game and the SuperCupNI Junior section.